Ah, this is a lovely recipe. It’s tasty, it’s colourful, it’s not that difficult and it’s quite fun to make. 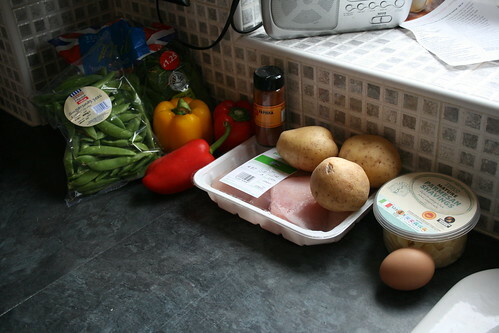 Plus it’s full of vegetables, which is always nice. It’s another one I adapted from a SW magazine. It’s partly adapted because it has tomatoes, and as you know I hate tomatoes, and partially adapted because I am an idiot and bought parmesan flakes rather than grated parmesan, or a block of parmesan. But it works, so who cares that I got it wrong? Preheat your grill to a medium/high heat. The recipe said medium and I ended up having to cook my chicken for almost twice the amount of time the recipe stated, so go for medium/high. 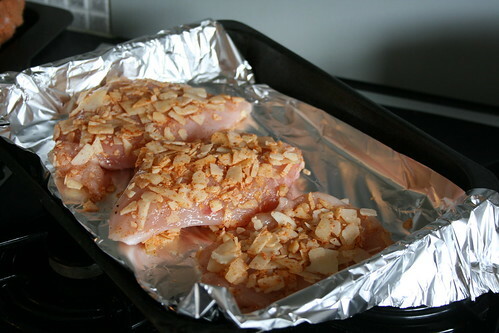 Then line a grill pan with foil. 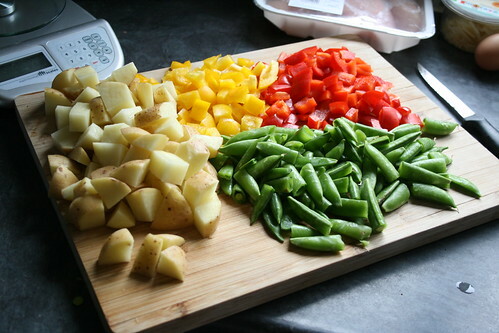 Prepare all your vegetables, just to make your life easier. Deseed and cube the peppers, cut the sugar snap peas/mangetout in half and cube the potatoes. It should all look very colourful and pretty. Now you need to flatten your chicken. This is quite fun. 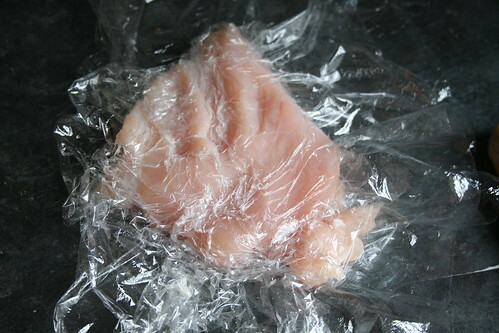 Place it between two pieces of clingfilm, and beat it with a rolling pin until it’s slightly flatter. You don’t want to hit it so hard that it disintergrates, but it needs a fair bit of force. So, don’t imgaine your worst enemy — instead, go for that person at work with the annoying voice. 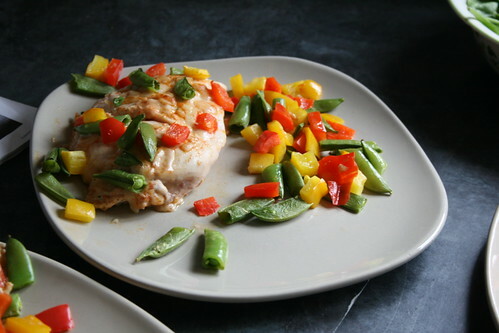 Put the egg white in a wide, shallow dish, twist in some pepper, and beat until it’s frothy. Then mix the parmesan cheese with one teaspoon of the paprika. 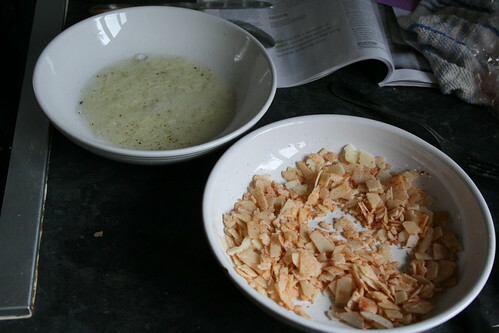 I imagine this will work best if you’re using grated parmesan rather than flakes, like I was. Put the cheese and paprika mix in another wide, shallow dish. Dip both sides of the chicken in the egg, and then in the parmesan mixture. Again, I imagine this will work better with grated cheese. It was difficult to get the flakes to stick on properly, and rather than my chicken having a nice, even, cheesey crust, it actually looked a little bit like a dinosaur. Pop the potatoes in a pan of boiling water now, and let them cook for about 10-12 minutes until tender. 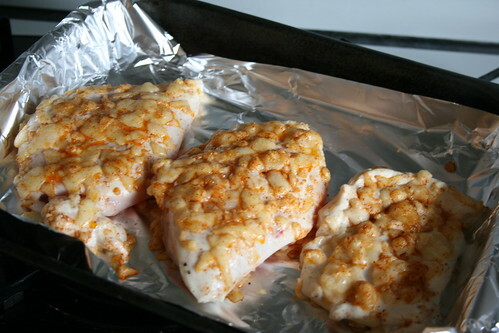 At the same time, put the chicken under the grill for about 6 minutes, until the cheese has melted. 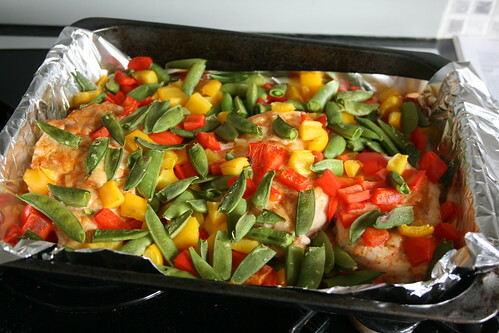 Flip the chicken over, trying to keep as much of the crust as you can. 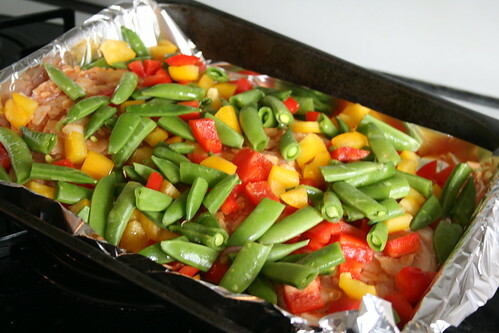 Then scatter the vegetables over the top and grill for another 5-6 minutes. 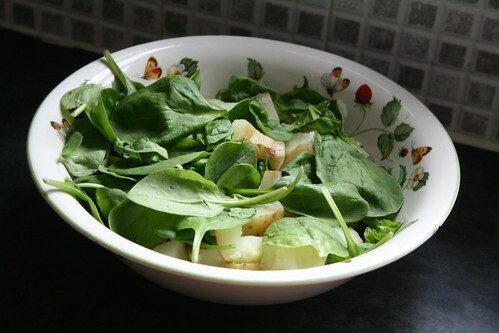 When the potatoes are ready, drain them and mix with the spinach. Drizzle over a little fat free vinaigrette (or, as I did and was lovely, some balsamic vinegar) and put in a serving bowl to leave on the table. Mmmm. There are a few more photos here. As usual, let me know if you make this one — and if you make it with grated parmesan rather than flakes, please send me a photo so I can show you what it’s SUPPOSED to look like!